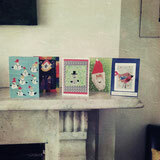 I know there were theething problems, but the Christmas cards have finally arrived and they are great! It is wonderful to be able to send cards made by our children to friends and family - specially if some of them live far away. I know there were fustrations regarding the fact they were a few days late, but this is the first time we have done it and we have learned a lot! Mainly to start much earlier - so don't be surprised if we start talking about Christmas cards in October! Anyway, as always thank you for your patience and support. It is all for a good cause.